Getting the Google Summer of Code has its advantages, but it comes with certain pains too. I understand that since the GSoC is an international competition, but they provide us international prepaid cards, which makes them unusable in most Indian websites. One website where the cards do work, is Flipkart. Flipkart is known for its exceptional service. Or so I heard. I had ordered a few things from Flipkart in the past and never had any issues with them (except a part of the order being cancelled due to unavailability of the item- with a proper refund of course). As soon as I came to know that the GSoC card would work in Flipkart, I knew I had to order something to satisfy my curiosity! I eventually decided I needed a backpack more than anything. Most of the American Tourister backpacks in Flipkart seemed small and I needed something bigger, when I stumbled upon this beauty, with the title "Puma Elite Large Backpack", each word in the title prompting me all the more to buy it. Two things was fishy- the dimensions were not specified and the product description had the word 'large' mentioned too many times. I decided to order it nonetheless. The price was ₹ 1799, just below $30 on my card considering the declining rupee. I received it relatively fast too, as it was shipped from Bangalore. The moment the delivery guy took it out of his assortment of delivery boxes, I knew I had been tricked- it looked small. Very small. The size a standard five student would use. Yes, it was made of the finest material and had a lot of compartments as promised- but the basic fact remained the same. A bag which mentions "large" in its title and zillions of times in its description did lot look large to me. I promptly came up with a review of the product in Flipkart to make sure others do not fall for the same thing, giving it a one star rating. I give it a one star rating because the title and description are very misleading. One of the "key" features is mentioned as "Large Bag". It is anything but that. The dimensions as given in the tag are 45 cm x 33 cm x 19 cm. Also, the image shown here is squeezed a bit making the bag look taller. You can get an idea about the extent by checking the extent to which the puma logo has been squeezed in the image. Yes, it has a lot of compartments, and it made of the finest material, but the fact that the title is misleading makes me feel really bad about Flipkart (or perhaps it's the seller's fault). Do not buy it if you are looking for a "large" bag. To demonstrate the extent to which the image has been tampered with, here is a comparison between the image and the original product. Note that I kept my 6" Kindle next to it so that you get an idea of how big the bag actually is. The review stayed there for a day, until I got a mail from Flipkart customer review team with the title "Please edit your review of Puma Elite Large Backpack". It said. 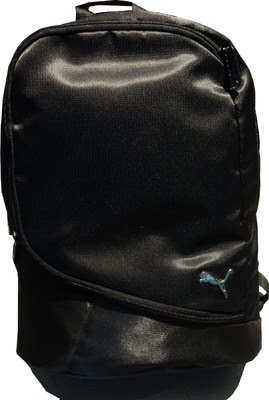 Thank you for your review at Flipkart for Puma Elite Large Backpack, on Mon Aug 5 2013. We appreciate the effort you put into it. We noticed that your feedback has highlighted certain errors on the Flipkart.com website. We thank you for taking the time to inform us of the same. We have notified the concerned team to get the details checked and update them upon verification. However, the Product Reviews section is for customers to share their experience with the product, helping other customers make informed purchase decisions. We hope you understand that your comments cannot be displayed in this section. I don't understand what was wrong in the review. For as long as I use this backpack, I will always be reminded of the fact that the title mentioned the word 'Large' and the backpack turned out to be anything but that. How can I write a review that praises the product when the very words used for the marketing are flawed and biased? I decided not to argue with Flipkart customer service, as my experience with customer service has not really been a love story. I knew I would write on this matter, so I decided to do so sooner rather than later.